An already-weird August, with record highs and lows, delivers a parting shot in the form of an intrusion of cool damp air, producing fog throughout the neighborhood. The overnight low was 45 degrees and we're on track to reach 90 degrees today. Kingbird is in the bottomlands of the lower Cosumnes river watershed and receives cold drainage regularly, in all seasons. A nearby low spot saw an early-morning low of 39 degrees a few weeks ago, and that's not unique for August. In the winter, our lows are generally 5-8 degrees lower than the offical record for nearby communities. Annual incursions into the low 20s (or even high teens) are normal. Last week brought a brief reminder of what summer is supposed to be - two days of 105-106 degree highs. For Kingbird, it was the first excursion of the thermometer over 100 all year. Although brief, the spike helped bring lots of melons and tomatoes to ripeness. Two days later, we were down to a high for the day of 74 and back to wearing sweaters in the morning and evening. It's been an abnormally cool summer, with daytime highs typically in the range of 85-90 and nighttime lows of 50-55. As a farmer friend said, it's been a great summer for living and a bad summer for farming. He's still guessing as to when he'll be able to harvest his corn. Rotten City Pizza, Hollis Street, Emeryville, just over the border from the People's Republic. The name recalls an era when much of the Bay Area's vice was concentrated there. An Alameda County District Attorney destined for much greater things - Earl Warren - once referred to Emeryville as "the rottenest City on the Pacific Coast." It was known for its speakeasies, racetracks and brothels and general lawlessness. But that was then. Now it thrives in a mostly good way, a model for the new urbanism. Kingbird Farms, vaguely east, over the hills, mid-harvest of a variety of wholesome things. 10 pounds or so of Kingbird heirloom tomatoes, delivered over the counter. 1 luscious large pizza (there is no "small" or "medium") featuring a few of those heirlooms, delivered back. We paid for the beer - Speakeasy Double-IPA. Four members of the Ardeidae family - great blue heron, great egret, snowy egret, and black-crowned night heron - as well as American white pelicans scour our shrinking slough for fish, frogs and insects. 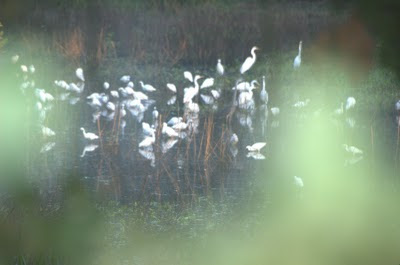 The herons and egrets congregate with the pelicans, seemingly eager to get their share of the remaining catch. Thirty or so pelicans arrived like a band of roving marauders late last week. They treat us to an elegant aerial display at dawn and dusk. Although silent, the bird's size and wingspan (8' - 10') create an audible whoosh as they approach, alerting us to look up. Today's dawn brought another gem - a dozen Caspian terns wheeling and calling high overhead. The Caspian is the world's largest tern and this group was probably in migration to its wintering area in northern South America. Tomatoes came to France in 1790, from the Americas via Italy, and in France, as here, tomatoes are now integral to cuisine. Audrey, cheerful, curious, quick-learner, came to us from Paris as a first-time WWOOFer in late July. It's been a great tomato year so far. Although temperatures have been far below normal so far this summer, the tomatoes are reaching a good size and ripening steadily. A looming heat wave should give us enough ripe ones to begin drying some.